TouchCopy For PC is a software to copy songs, playlists, podcasts, and videos from your iPod or iPhone to your PC or into iTunes. TouchCopy For PC can back up all your music and video in a couple of mouse clicks, transfer songs, playlists and videos from your iPod directly into iTunes. TouchCopy also transfers your album art, ratings, play count, and other song data. Back up all of your iPods music, movies and playlists at the touch of a button. ...... Search for music on your iPod. The search results can be saved to your computer or transferred into iTunes as a playlist. 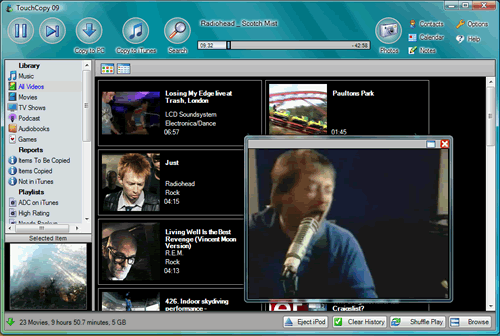 Play music and video on your iPod through your PC without having iTunes installed. TouchCopy For PC supports your Last.FM account, if you have one. Use TouchCopy to change your music rating. View and save photos on your iPod. Save your games from your iPod to your computer or directly back into your iTunes library. From there, you can load them back to your iPod. View, edit, and create notes on your iPod. * Transfer Music, Playlists, Podcasts and Videos. * Copy Artwork, Ratings, Play counts and other song data. * Backup Photos from any iPod or iPhone. * Manage Contacts, Calendars and Notes on your iPod. * Use your iPod Touch or iPhone as an external hard drive. * Comes with free updates and free customer support. A application for modern mobile platform. Instant Access to up to 4000 TV Channels on your PC or Laptop. Qweas is providing links to TouchCopy For PC 9.97 as a courtesy, and makes no representations regarding TouchCopy For PC or any other applications or any information related thereto. Any questions, complaints or claims regarding this application TouchCopy For PC 9.97 must be directed to the appropriate software vendor. You may click the publisher link of TouchCopy For PC on the top of this page to get more details about the vendor.